Here I am in Suzhou, China in 1988. And I wore white sneakers, white pants and a white jacket, can you say total foreigner? My mother's cousin to my right hosted us in his beautiful city and lent me his family's best bicycle. We felt bad about taking rickshaws everywhere so we offered to bike with them. 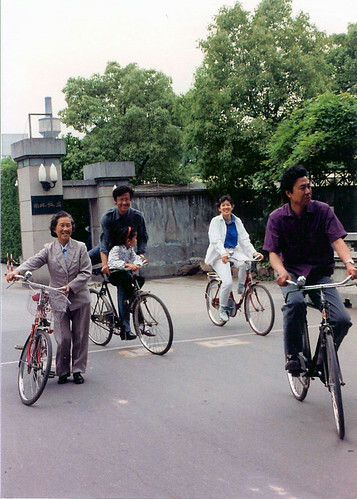 Our relatives were all used to biking everywhere as none of them owned a car, but they were concerned whether we'd be able to handle biking in China. Hey, I've biked in the streets of Boston, MA and Oakland, CA, how bad can it be? But still they only took us on the shortest of bike rides in their picturesque city. Here is a typical street scene. 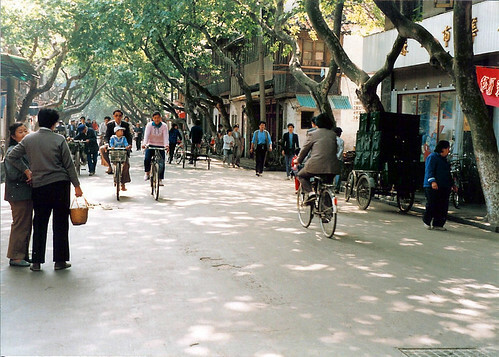 Beijing has real city streets with thousands of bicycles, cars, trucks and buses vying for the same roads. We biked to the Summer Palace, and I thought we were not going to make it there. It was extremely hot, dusty and the exhaust fumes were choking us. You don't know dusty unless you've been to China. Perhaps the wild west was dusty like this, but the US is dust-free nowadays compared to China. And the ride was a lot further than we thought. I did take my camera along and got this shot of the Marble Boat. Photoshop has sure breathed new life into these old faded photos whose negatives were x-rayed a half dozen times before being developed. This is neat! I went to Beijing almost 10 years ago and I loved that city. I will go back in a heartbeat. But I do agree about the pollution. Everyday it looked so cloudy. What an amazing trip that must have been. I was just reading the new National Geographic magazine - all about China. The articles made it sound like biking is about over in the big city. It was wonderful to see the photos that I took 20 years ago. 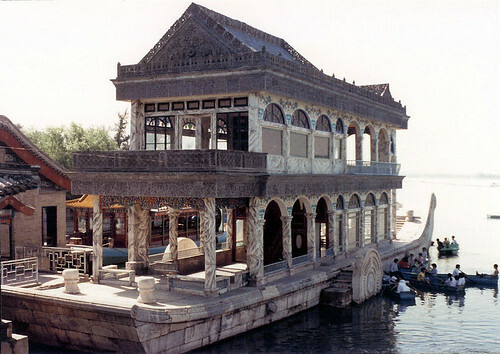 Suzhou is deed and beautiful and unique ancient city, established 2500 years ago. The first picture depicted a casual bike outing for the family. Your cousin 何昱 was carrying his little daughter, 紫竹 on his bike. Grandma of 紫竹 and my nephew 王力, one of your other cousins were biking in front of you. I attended 紫竹’s wedding two years ago, what a beautiful young couple! !